This simple, 4-ingredient Kalamata Olive Cream Cheese Spread recipe is a tasty nibble everyone will love at your next happy hour. Are you ready for a killer appetizer? One that can be made in advance, will keep for weeks and is one of the easiest appetizer recipes to make? This Kalamata Olive Cream Cheese Spread is the real deal. I’m blessed to live near several quality grocery stores, and the inspiration for this Kalamata Olive Cream Cheese Spread comes from one of my favorites stores. When I stopped to buy some one day and discovered they were out of stock, I decided to recreate the recipe at home. Turns out it’s just as easy to make as it is to buy it. Now I don’t ever have to worry about out-of-stocks when the craving hits. What ingredients are in this olive spread? There are only 4 ingredients in this recipe: Kalamata olives, cream cheese, garlic and parsley. That’s it! Appetizers don’t get much easier than that. 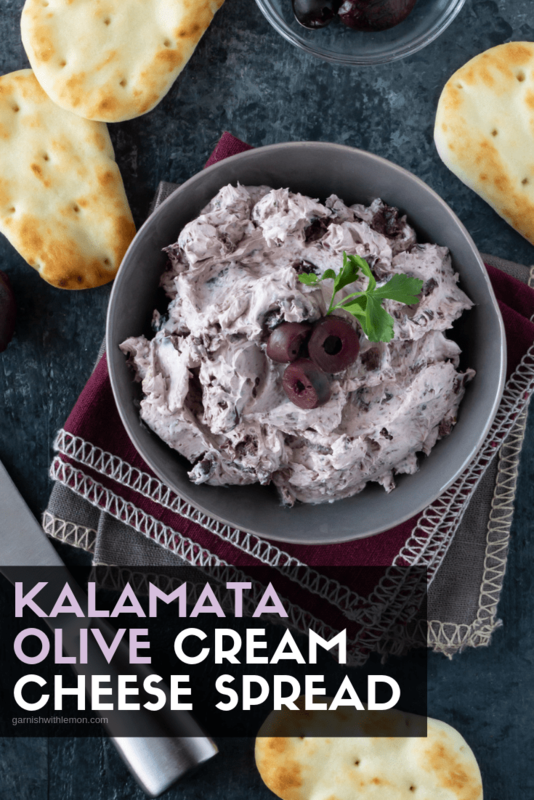 What do you eat with this Kalamata Olive Cream Cheese Spread? If I’m serving this cream cheese spread as an appetizer, I slather it on baguette slices and or torn pieces of pita bread. It can also hang with sturdy veggies like celery and carrots. If I spy leftover spread in the fridge, you can bet it will be smeared all over my morning bagel. 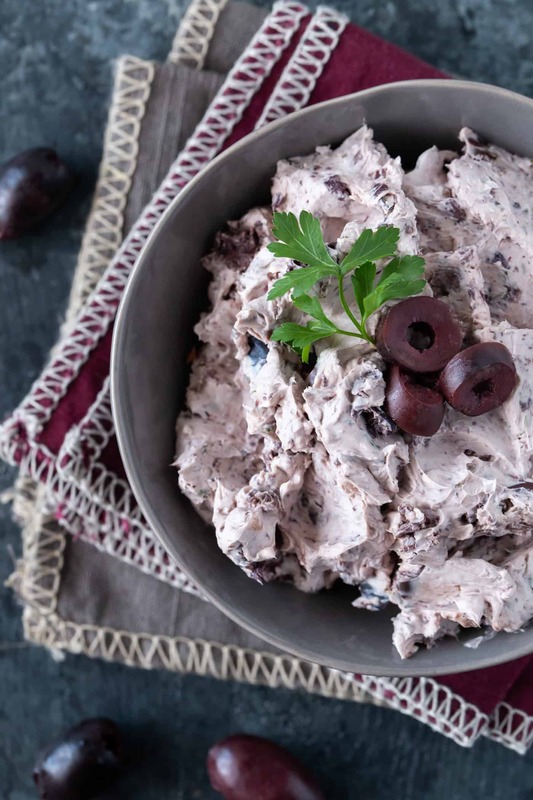 Is this Kalamata Olive Cream Cheese Spread like a dip? No, it’s thicker than a dip and I definitely consider it to be more like a spread. Ever had a cream cheese ball? The consistency is similar to that but you can eat this spread right away rather than waiting for it to chill and firm up in the fridge like you must do with a cheese ball. That said, I usually do let spread hang out in the fridge overnight. The flavors seem to develop even more with just a short rest in the fridge. 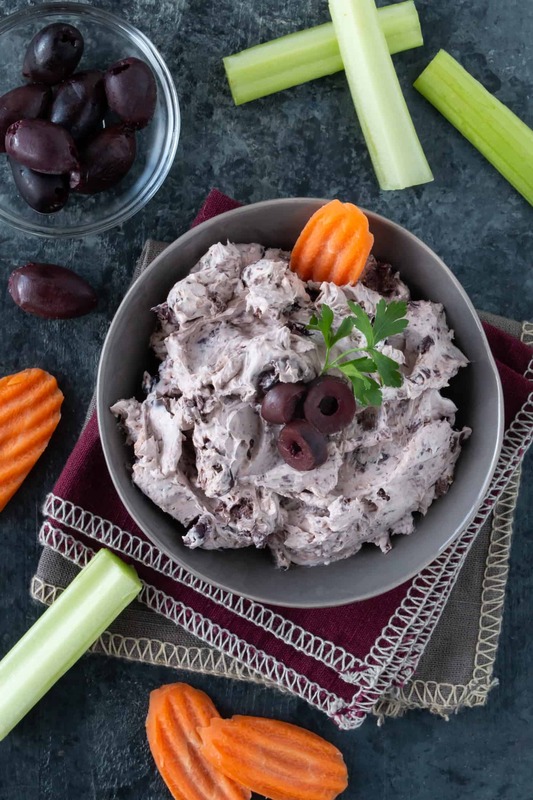 However you indulge with this Kalamata Olive Cream Cheese Spread – spread on crackers or pita bread, as a decadent dip for veggies (or even slathered on your morning bagel) – it is sure to become a mainstay in your appetizer arsenal. Tip: Looking for a true olive DIP? Check out our easy Green Olive Dip. It’s consistently one of the most popular dip recipes on our site. Give it a try and you’ll see why! 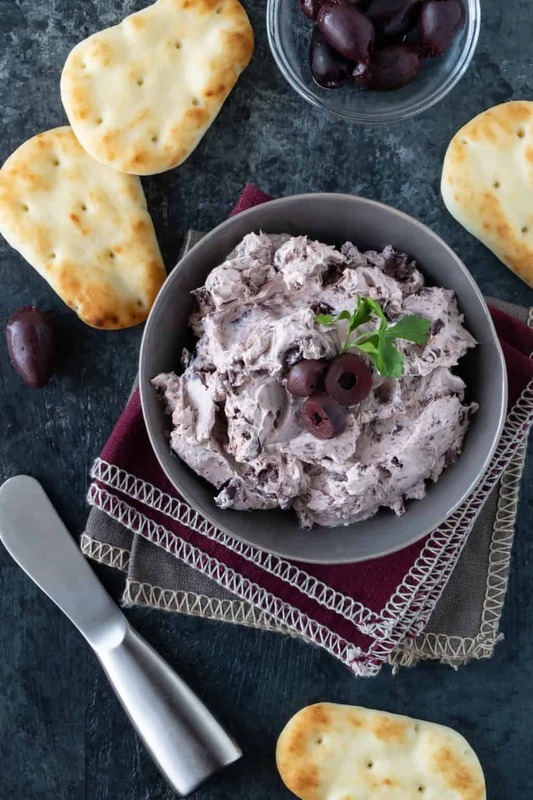 This 4-ingredient Kalamata Olive Cream Cheese Spread takes just minutes to make - a perfect appetizer for last minute guests! Using a hand mixer, beat the cream cheese until smooth. Stir in the olives, garlic and parsley until thoroughly incorporated. Serve immediately or refrigerate until ready to serve.